Sorry, we are currently sold out of 'FIJIT Friends Willa Interactive Toy'. REVIEW: Willa, a smart, fun, and funny Fijit Friend, is an interactive toy that'll become your child's new best friend. 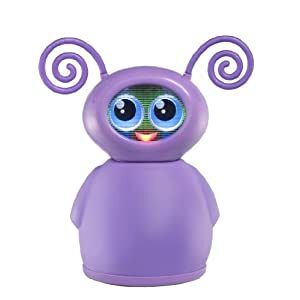 With supple skin that enables amazing movement, this trend-setting purple Fijit Friend has several interactive features, including voice recognition, beat detection, dance mode, and over 150 built-in responses. Recommended for ages six and up, Willa will be a fast and lasting friend that chats, dances, jokes, and performs. * Colors and decorations may vary. Willa is always a step ahead of the latest and greatest, whether it's fashion or whatever's new and cool. She's confident, stylish, and a natural leader. Like all Fijit Friends, Willa was created when a gooey science experiment was brought to life by the power of music. She loves to laugh until her sides hurt, dance until she's dizzy, and be herself with her one true bestie. The Fijit Friends Interactive Toy Collection consists of four different Fijit Friends (sold separately), each with their own different personalities and jokes. This Fijit Friend is made with a durable plastic head, cute removable ears, and a squishy shell that's a delight to touch. Poke her belly to prompt cool movements and fun surprises. Your new friend's body and head will turn, bounce, and wiggle. Even her LED face and eyes will light up in response to stimuli. With unique movements and a huggable form, she'll make a fascinating new BFF. Play your own music and watch this Fijit Friend boogie in dance mode. Beat Sensors allow physical and emotional reactions to different styles of music--from slow ballads to lively pop tracks. Dance along as she rocks, twirls, and bounces to the beat. She'll even perform her own original songs. Eager to chat and make you laugh, this Fijit Friend features voice recognition, allowing her to identify over 30 voice commands and respond with more than 150 built-in phrases and jokes. When it's time for bed, wish your Fijit Friend a goodnight. Her belly will glow like a nightlight as she nods to sleep. This Fijit Friend can also detect and respond to various media platforms, including mobile applications, webisodes, television commercials, and more. Willa Fijit Friend, five AA "Try-Me" batteries, and instructions.